16 is a composite number, and it is 4 squared. 16 = 1 x 16, 2 x 8, or 4 x 4. Factors of 16: 1, 2, 4, 8, 16. Prime factorization: 16 = 2 x 2 x 2 x 2, which can also be written 16 = 2⁴. Since √16 = 4, a whole number, 16 is a perfect square. 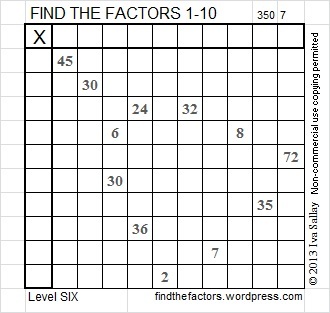 When 16 is a clue in the FIND THE FACTORS puzzles, use either 2 x 8 or 4 x 4. Only one of those sets of factors will work for any particular puzzle. 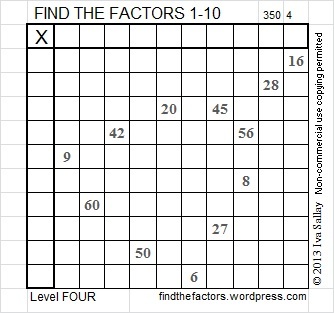 Find the Factors is a type of logic puzzle. To solve one of the above puzzles, place the numbers 1 – 10 in both the top row and in the first column so that those numbers are factors of the given clues. For each puzzle, there is only one solution. Click on 10 Factors 2013-12-16 to find these and a few more puzzles, as well as last Monday’s solutions.